MELISMATIC: NOW KPOPPING: SHINee Asks 'Why So Serious'? NOW KPOPPING: SHINee Asks 'Why So Serious'? Settle in. This is gonna be a long-winded one, seeing as it regards my #3 KPOP (male) bias. 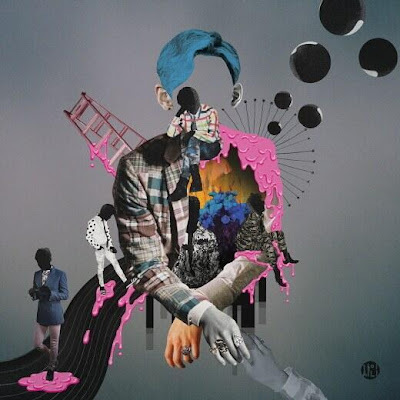 SHINee made good this past week on their promise of a "second half" album to follow up February's Dream Girl - The Misconceptions of You via the imminent release of Why So Serious? - The Misconceptions of Me. I've experienced a whole range of emotion regarding this promotion: the rumors of it being all ballad were proved false (so yay! ); the title song is basically a The Dark Knight reference (um...yay? ); the song has synthy guitar (yay! ); but the video/early promotions will not include lead vocalist (and my technical bias in SHINee, there I said it) Jonghyun (uh...WUT?). For those of you who aren't up on the KPOP news of the day -- SHINee's lead vocalist was in a car accident, resulting in him needing more time to physically heal (read into this what you want, conspiracy theorists -- I will not succumb to your meanness regarding my SHINee bb's). So yes, I was in that bitter camp that didn't really understand why (soooo seriousssss -- OK, I'll stop) SM couldn't have delayed this comeback a little longer so SHINee could come back as the OT5 piece they are. I mean, come on -- they've delayed EXO's supposed "come back" for reasons unknown -- you couldn't wait a few weeks till Jong was good to go with his velvet vocals? Sigh. According to reports, he will join promotions as soon as he's able -- but the video will forever and always be Dino-less. "Why so serious? / Romeo and Juliet / It’s not a sad love story / Everything will be alright / You’re a love story maniac /Who knows about the “inevitable happy ending” "
The song itself tries to metaphor people putting too much pressure on stereotypical love relationships to be like zombies following the pack. SHINee are zombies coming back to human life (kinda like that Warm Bodies movie...but not...I guess). Is it as "replay"-able as say "Sherlock" or "Lucifer" (see what I did there?)? Well...no. But it's a supreme grower and does get better with every listen. The dark imagery is the overall concept theme for Why So Serious? and is the thread that connects all of the songs on the set together (for the most part). So whereas Dream Girl was pretty light and fluffy laidback pop (a la "Love Like Oxygen" or "Sherlock" of yore), Why So Serious? is the darker more "Lucifer", "Ah.Mi.Go." side of SHINee. SHINee's split personality is finally acknowledged and embraced to show the unique duality of the group -- all set to a summery kind of groove. Really -- it's all about that layered shout-out hook breakdown climax of "Baby nal eotteoke saenggakhae? Baby eotteoke saenggakhae?" (Baby, what do you think of me? Baby, what are you thinking?) repeated twice. I could listen to that over and over to be quite honest. And Confession: in the Video Version -- Baby Taemin really takes the lead and looks totally in his element. The entire album on the whole bolsters my previous statement regarding Dream Girl -- all of SHINee have come so far vocally to be the tightest now as they've ever been (especially Taemin and Minho). They are on top of their game and it really shows in the material. As for the rest of the album -- while Dream Girl had it's sticky moments, Why So Serious? the album has more "save-able" b-side cuts to the point that (not unlike with Sherlock) I quite like the whole thing. In this day and age (whether it's KPOP or anything else), this is really rare that I don't really want to skip anything whilst listening. The set opens with aggressive, borderline-creepy "Nightmare" (dark imagery continues, this time with vampires), this set's "Spoiler" that was produced by the Hitchhiking team that also did some of my fave b-side moments from Dream Girl ("Hitchhiking", "Dynamite"). The repeated refrain of the stoic "Come and be my Dream Girl" (in English) is an obvious hint that Why So Serious? is the dark version of the sweet, romantic SHINee we saw the previous half of this set. "Shine" and "Dangerous" are uptempo jams that make up a "Medusa" chronology -- both are produced by Teddy Riley and the latter was written by Jonghyun. It also bares noting that KPOP STAR 2 finalist Andrew Choi also co-wrote both of these, along with "Why So Serious?" itself. "Orgel", the sole true midtempo, was also written by Jonghyun, and sits between the two "Medusa"'s. In my opinion, it's the weakest of the set, but more serves as a dreamy interlude. Synthy "Like A Fire" is another Herbie Crichlow number (he also did "Punch Drunk Love" on Dream Girl) that sounds very 80's-esque. Main vocalists Onew & Jonghyun inevitably shine brightest, especially when trading ad libs back and forth. Vintage-y "Excuse Me Miss" ("Vanilla Iceeee") harkens to Michael Jackson with a lazy, arrogant swagger that SHINee really pulls off well. All of them sound freaking fantastic on this one. This leads to the staple SM b-side in Kenzie's "Evil", another inevitable favorite of mine. Not only does it have the "Hug" heartbeat reference intro, it's the staccato pre-chorus hook and the soaring layered chorus that make it a fantastic climactic pop jam. And finally, set the closes with the odd man out in the traditional piano ballad "Sleepless Night" -- the lyrics of which were written by, are you ready for this?, my ultimate bias in TVXQ! 's Shim Changmin. (Cue Mel crying Mascara Tears.) It's SHINee at their unequivocal harmonic best -- the song itself sounds a bit like a TVXQ! ballad of yore. I had so many lovely eargasms listening to this song (over and over and over) -- and you all should know by now, I'm not really here for SHINee's ballads. Minho is allowed a serious vocal part and it sounds lovely. Taemin's high notes are commendable. Jong's falsetto and big voice is restrained and controlled -- proof that even the group's requisite vocal gymnast is also improving. So well done. Claps. While the promotional aspect is a bit haphazard (let's call a spade a spade -- that music video was pretty damn rushed/last-minute/half-assed), we can't deny the quality is there, even if it is hidden behind the curtains. Just like Part 1, this is a cohesive set that doesn't have a truly bad moment in the nine tracks. Evil is great, but I continue to love their embrace of MJ-era New Jack with Teddy Riley. In fact, I would have love to have heard Shine and Dangerous back to back in the track listing (Orgel/Music Box is the weakest track, but still not bad). The only item I disagree with is Sleepless Night, which to my ear is killed by the unnecessary rap in the middle of the track. Maybe I'd feel better about it if I actually understood the lyrics, but sonically it doesn't work for me. Favorite track? Probably Dangerous (RIP MJ). I know I'm pretty much alone in this, but I always thought "Hello" is a-ok! But I cringe when I hear "R(L)ing Ding Dong".